The Office de Tourisme Terre des Cro-Magnons is in the middle of the village of Les Eyzies on the appropriately-named Avenue de la Préhistoire, close to many hotels, chambres d'hôtes, restaurants, shops, and the Musée national de Préhistoire. They have free Wifi so you can download your email and upload your photos. Above, the Office de Tourisme on Avenue de la Préhistoire in Les Eyzies. 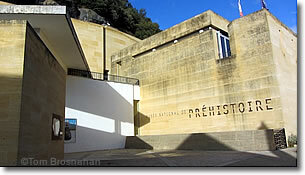 Below, the Musée national de Préhistoire.